Nothing But the Truth will surprise you, both in terms of how the story plays out and with how expert a motion picture it reveals itself to be. Writer-director Rod Lurie reflects unfortunate truths about our modern government’s restrictions on journalists, and the resultant fear and thus failure of the modern media to keep the government in check. For such ideas to present themselves in film, and remain simply part of the story versus outright soapboxing, offers a unique rarity only matched by benchmarks like All the President’s Men and JFK. In the film, Washington D.C. reporter Rachel Armstrong (Kate Beckinsale) breaks a story that Erica Van Doren (Vera Farmiga), the wife of the U.S. ambassador in Venezuela, is actually an undercover CIA operative. In a report issued to The White House, she claims our country’s current attack on Venezuela, in retaliation for a presidential assassination attempt, is unfounded, and that there is no connection between Venezuela and the presidential shooting. Armstrong is jailed in an attempt at coersion for reasons of “national security” when she refuses to name her source, every reporter’s right; whereas the government needs to know who’s giving out names of its top-secret agents. Government-appointed special prosecutor Patton Dubois (Matt Dillon), though just doing his job, plays the system in his favor against Armstrong, while her newspaper’s lawyer (Noah Wyle) and her high-powered defense attorney Alan Burnside (Alan Alda) pick up the pieces. Meanwhile, outwardly a soccer mom, Van Doren’s personal and professional lives are ruined, her seniors suspecting she’s the informant. Armstrong is ripped away from husband (David Schwimmer) and her son, jailed for about a year with each day a struggle, and criticized for not sacrificing her journalistic integrity to return to her son, while her husband drifts further and further away. Beckinsale, when she’s not fighting vampires or werewolves in Underworld or Van Helsing, has the potential for great acting, which she displays here with some impressively stern humanism. But her supporting players, particularly Farmiga and Alda, steal her thunder in their ability to convey the simultaneous layers of anger, sympathy, and moral conflict their characters feel. The film asks which is more important to preserve: the ever-ambiguous concept of “national security” or the journalistic right to protect one’s sources. As Burnside’s speech to the Supreme Court outlines, if journalists are forced to give up their sources to the government, then no journalist will ever be trusted with such an important governmental scoop again, and then the power of journalists to act as the watchmen of the government is castrated as a result, making us just another country—no longer “by the people, for the people,” but by and for the preservation of the current administration no matter what the cost. 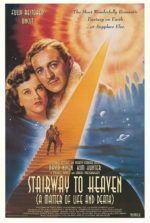 However fantastical and melodramatic this end sounds, we’ve already reached the extremes detailed within the film, even if the standard disclaimer assures similarities to actual persons or events are coincidental. Lurie simply embroidered the case of Judith Miller, the New York Times reporter who spent 85 days in prison after she refused to name her source when her story led to Valerie Plame being identified as a covert CIA agent. Her blown cover and the subsequent investigation revealed Plame to be the wife of former ambassador Joseph Wilson, who used privileged information to publically accuse the Bush administration of exaggerating and altogether falsifying information to justify the attack on Iraq. …These are facts… This is considered a breach of “national security” simply because the lie used to pursue “war” was uncovered. But isn’t that the crucial function of our press, to scrutinize the government and therein protect the people and reveal the truth? And why were the reports on this story more concerned with the fates of Miller and Plame than the lie told by the Bush Administration? For such insightful and dramatically significant political commentary, look no further than the work of Lurie, creator of the best political-minded pictures on the sunny side of Hollywood. 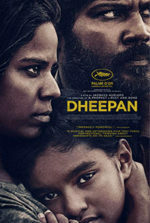 His sharp observations and dramatization of contemporary issues for the sake of his narrative always serve to enhance his screen story, keeping the material relevant while never becoming overly preachy. In The Contender and his short-lived television series Commander in Chief, he criticizes the inevitable and unfortunate sexual politics that attempt to reduce female politicians into victims of their gender, as if femininity somehow influences political idealism. Whereas his criminally underseen Deterrence recognized how the people influence the president, how the president keeps secrets from the people “for their own good”, and how this relationship can never be equalized. In these cases, as well as Nothing But the Truth, Lurie’s perceptive view takes a last-minute detour in the form of “twist” endings. But these twists are never employed to shock the audience; of course, they’re an exciting and surprising development within the story, but they are not merely there to surprise you. Instead, they augment the drama upon second viewing. When Armstrong’s source is eventually revealed in the final frames, her entire self-sacrificial exercise is suddenly justified by Lurie’s precise, effective choice, in a way that is both unexpected and powerful. That a film like this still has the capability of moving us, and becoming more than a series of cliché court cases and long stretches of political jargon, speaks to Lurie’s talent as a storyteller and commentator. 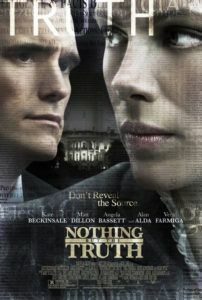 Though appearing in only a handful of theaters throughout the country due to reported financial troubles with the distributor, you’ll have to seek out Nothing But the Truth on DVD (which is now available), where the small screen might lend a more personalized impact. This is the kind of film that audiences won’t expect to be this affected by, because when it’s over, its weight stays with you and grows over time. Viewers will find themselves ruminating over the clever and distressing nature of Lurie’s remarks, his ending, and how the moral and patriotic complexity of his subject lingers long after the end credits, and how extraordinarily rare this effect is for commercial film.